John Pesta ~ Author of "Safely Buried" and "The More Your Stir It"
I am pleased to announce that my second mystery novel, “The More You Stir It,” is now available both as a paperback and as an e-book. Once again small-town newspaperman Phil Larrison becomes embroiled in a series of deadly events that unfold in the picturesque hills of southern Indiana. These events grow out of a case that began seventy-five years earlier when a black man was lynched by the Ku Klux Klan behind the county courthouse. The lynching is dredged up by seventeen-year-old Kelly Marcott, whose mother has banished him from Los Angeles to live with her father-in-law in Indiana. Kelly has gotten himself in trouble with the police in L.A., and his mother is hoping that his exile will keep him from getting in more trouble. After moving to Indiana, Kelly enrolled in the local school and began publishing an underground newspaper. One day he finds an old box of photos of men who belonged to the Klan in the 1930s, some of whom are posing around the body of a lynching victim. The members of the Klan can’t be identified from the snapshots, but someone wrote their names on the back of them ~ and Kelly has published the list of names. So much for staying out of trouble. 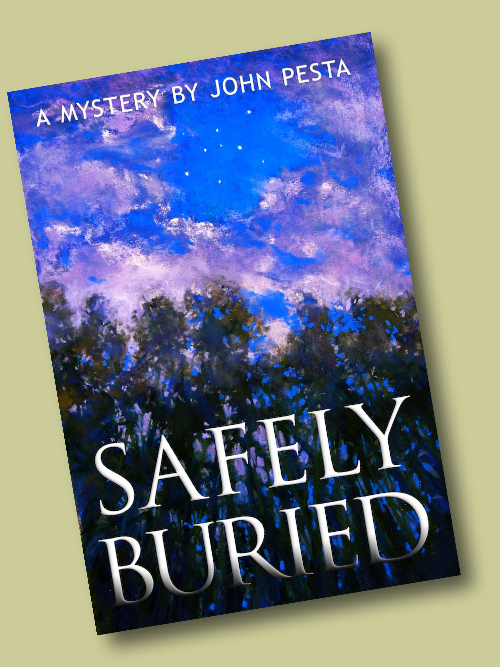 The first mystery in the series, “Safely Buried,” has been honored with awards including one for Best Fiction in the 2012 Best Books of Indiana Contest sponsored by the Indiana State Library. 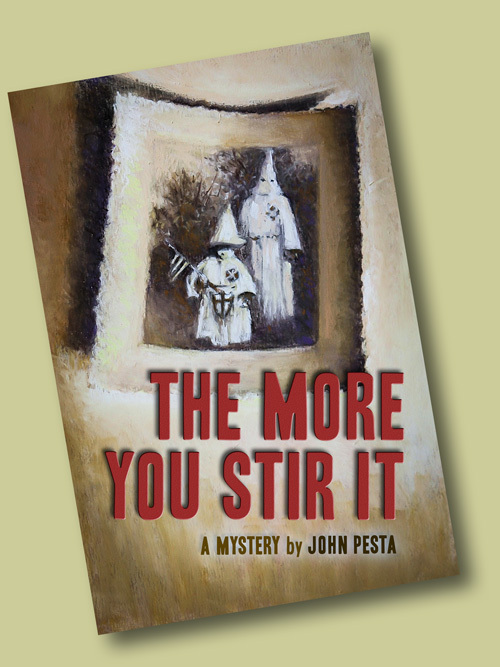 Buy your copy of “The More You Stir It” online: “The More You Stir It” by John Pesta is available in paperback at Amazon.com and on the Kindle e-reader. Don’t have a Kindle? You can download a free Kindle reading app for your mobile device from Amazon. After reading “The More You Stir It,” please consider writing your own review on Amazon. “Suspense writing at its best.” The Amazon.com reviews of “Safely Buried” keep coming in! “This is a great read ~ wonderful storytelling,” says one reviewer. “Dry wit permeates the telling,” says another. “An easy book to forget to put down.” See the full reviews here. If you’ve read “Safely Buried,” please consider writing your own review on Amazon. “Safely Buried” was named Best Book of Fiction in the 2012 Best Books of Indiana contest, a competition sponsored by the Center for the Book at the Indiana State Library. Set in the low hills of southern Indiana, “Safely Buried” is a riveting mystery featuring newspaper reporter Phil Larrison, whose well-intended act of kindness soon lands him in a tangled web of murder and corruption. Author John Pesta gracefully balances strong character and plot development with an action-packed storyline. Though a first-time author, Pesta’s background in journalism is readily apparent through his immense storytelling ability that rivals that of seasoned mystery writers. While we would recommend this book to mystery enthusiasts, it is also a great book for novices due to its well-developed characters and swift, suspenseful pace. It is the ideal choice for the 2012 Best Fiction Book of Indiana award due to the book’s entertaining, compelling, and suspenseful storytelling, as well as its setting in southern Indiana. Buy “Safely Buried” online: It’s available in paperback at Amazon.com as well as on the Kindle e-reader. There is an audiobook version, too. About the author: “Safely Buried” and “The More You Stir It” are set among the steep hills, or the knobs, of south-central Indiana, where for seventeen years John Pesta published a historic smalltown newspaper that dates back to the days of the horse and carriage. During those years he wrote many articles for the paper ~ obituaries and editorials, town-meeting news and high-school sports, stories about giant pumpkins and dead rattlesnakes. Born and raised in Allentown, Pennsylvania, Pesta received degrees from the University of Notre Dame and the University of Virginia and spent a year at the University of London on a Fulbright fellowship. His short stories have appeared in literary journals including Sou’wester, The Florida Review, Four Quarters and Prairie Schooner. He lives near Brownstown, Indiana, with his wife, Maureen. “Safely Buried” was originally serialized online in 2010 at Fine Words Butter No Parsnips, home to serial fiction, art, short stories and photography. Copyright (c) John Thomas Pesta, all rights reserved. Contact the author by emailing JTP@JohnPesta.com. The artist Maureen O’Hara Pesta created the cover illustrations for both novels.